St. Kilda, Victoria, the home of two of Australia’s most notable clowns; Luna Park and Shane Warne. A suburb where I almost certainly wouldn’t want to live, but a place that I love to race. A half-distance PB in 2018 on this course had left me with pleasant memories of the location, however this was Melbourne and the chances of getting those sort of race conditions again were akin to spinning the barrel for a second round of Russian roulette. Somehow, I missed the bullet again and the weather turned out pretty good. My main reason for selecting the race was to give myself the maximum opportunity to recover from injuries late last year and to be in some sort of shape conducive to racing. 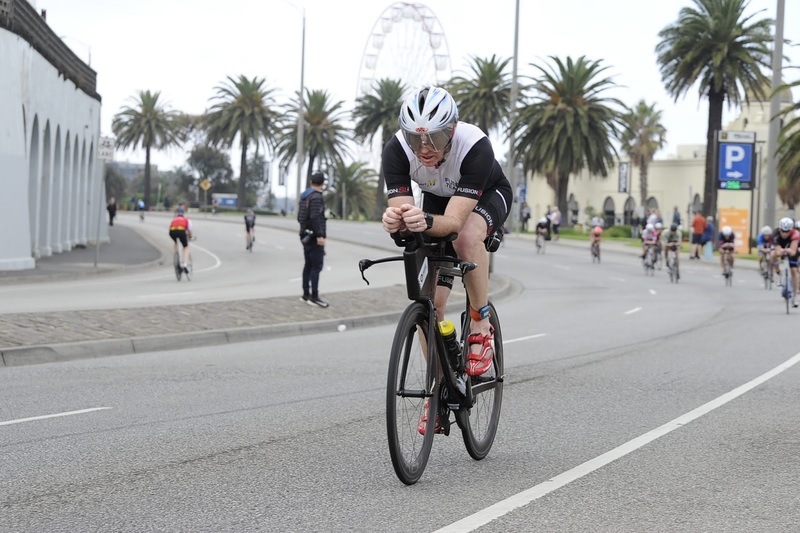 The lead up was good, a performance at Geelong that had me feeling like we were moving the right way, combined with some more bike and run gains since augured well. Still, when you know that you have to race faster than you ever have just to show some progress from a year earlier, the task can appear daunting. Race morning presented fairly good conditions. A grey, dull mist eerily enveloped the venue, it’s seems the norm in Melbourne. The temperature was how I like it; cool but not cold with only the hint of a breeze. The water was similar, you wouldn’t wanna be in there without a wetsuit, but you could still feel your face. The pro waves left at 6:50 with the scene at the swim start then becoming organized chaos. Waves every 90-seconds created a cavalcade of colour, with more latex than a big Saturday night at the Hellfire Club, air horns ringing seemingly non-stop and more than a few athletes scrambling for the start wave they had already missed. At 6:56 our wave became semi-submerged in Port Phillip Bay and began flailing our way along the 1900m course. We quickly combined with the stragglers from the wave in front and the speedsters from behind, which made for a fairly physical swim, featuring more hits than the Beatles. Eventually I was under the pier and into shore. My wife had achieved her race goal of making up three minutes on me in the swim and beating me into T1 by a few seconds. We exited together. The plan on the bike was to work pretty hard on the first two of the three laps, making use of the hard work we had done in recent times, before setting up for the run on the final 30km lap. It’s a reasonably flat course on the iconic Beach Road, with a good road surface, conducive to good riding and minimal risk. I didn’t muck around on the first two laps, pedalling harder than a Colombian drug lord. My heart rate was about 10 beats higher than I’d normally produce but it seemed to be producing results based on the 10km lap times I set up on my bike head set. The last lap was a little more relaxed with the reduced effort yielding an overall heart rate that was only equal to the highest I had ridden in the past. The outcome was my best to date, 2:31, three minutes faster than a year earlier. The big question was whether or not I could back it up with a solid run. While the first 10km felt reasonably comfortable to hold a target pace, I was weary not to try and over-capitalise and go harder. Half-marathons off the bike can be a bit like a dog turd in the sun, the longer it goes, the harder they get. From around the 14km mark, I broke down each kilometre, only concentrating on what I needed to do to get to the end of that 1000m stretch. The main motivation I gave myself was that I had the choice of two pains, the pain of discipline for another 30-minutes or the pain of regret, taking the easy path and letting it fall apart. 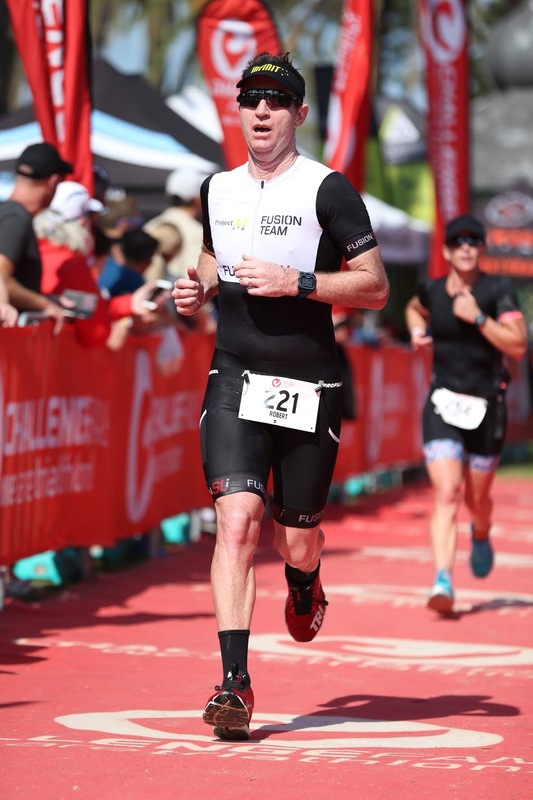 By the time I’d reached the finish chute at Catani Gardens, I had managed to string together my fastest run off the bike from the seven half-distance races I’ve completed and a gallop four minutes faster than the year before. The most pleasing part was probably the fact that there was only 20-seconds between my fastest and slowest km’s, so there was some sort of consistency throughout the 21km. My overall time of 4:58:35 was a PB, five minutes faster than the year prior and the first time I’d broken the coveted five-hour mark. 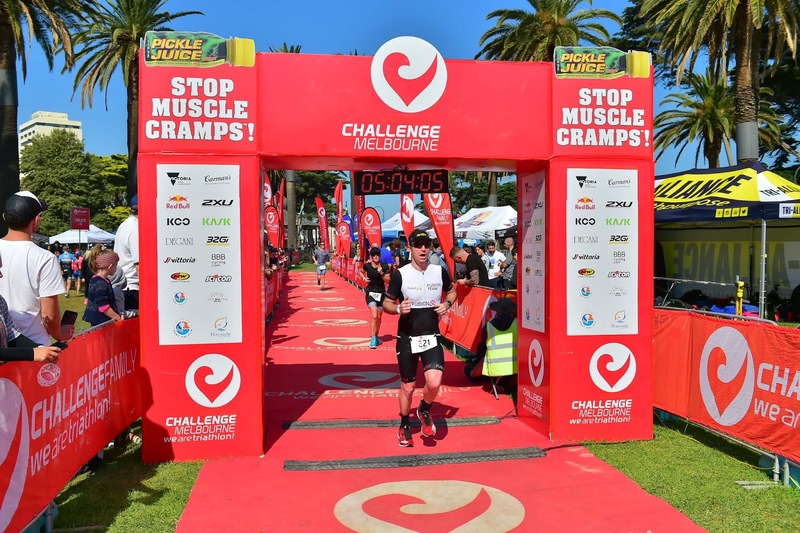 I’m not a fan of comparing courses so the biggest takeaways for me were the bike and run improvements from a year earlier in almost identical conditions and realising that it is possible to put a run together off the back of a harder bike. The patience of my coach (Nathan Miller) has been something that is only understood when you are there to experience it. A couple of frustrating years with Achilles issues must have made it a real pain from his perspective, so to finally put something together that is in someway indicative of the work he puts in and faith he shows is as satisfying as anything else. That’s the end of the season for me, which in some ways feels like it was just beginning. There was definitely a couple of races post-Christmas that were satisfying after an extended period of frustrations. Now it’s time to log some winter miles with an emphasis on running (including some exciting uncharted territory) before attacking a new triathlon season.